In terms of nomenclature, today’s drink is a nice segue from our last drink of the week, the Algonquin. That drink was (probably) named for the historic Manhattan hotel and its bar. The Knickerbocker is named for the archaic nickname for all New Yorkers, i.e., a Knickerbocker was once to NYC as a Hoosier is to Indiana. If you’re a tri-state area basketball fan, you probably know all this already. On the other hand, it’s also the completion of something of a trilogy with two other recent posts, the Blinker and the Monkey Gland. The common thread in these three drinks is a revived cocktail sweetener I’ve only recently become aware of: raspberry syrup. We’re not talking about just any raspberry syrup but specifically the stuff that’s manufactured by purveyors of jams and jellies and intended mainly to be poured over ice cream. The Knickerbocker always seems to feature gold rum and raspberry syrup but, beyond that’s it’s another one of those drinks where the recipes vary so greatly they’re barely the same drink. Here’s the version I went with, which I pretty much ripped off entirely from cocktail superhistorian David Wondrich. See what you think. Place the liquid ingredients in a cocktail shaker with plenty of ice. Shake very vigorously. Dump the contents, ice and all, into a double-sized rocks/old fashioned glass. Add the garnishes listed or other fruits of your choice if you’re feeling adventurous. Toast whatever you like, I’m out of ideas this week. I actually started my Knickerbocker holiday with the version featured in Ted Haigh’s Vintage Spirits and Forgotten Cocktails, which drew me into my raspberry syrup madness in the first place. That one featured an entire ounce of lemon juice with more sweet ingredients to compensate. I found it both too sweet and too sour. While there may be tons of variations of the Knickbocker out there, anytime I tried to vary the Wondrich recipe ever so slightly, I came up a loser. Deciding to switch my ultra-thick Smuckers raspberry for the more easily dissolved Torani raspberry syrup yielded an unpleasant medicinal taste. Chastened to some degree, I experimented with an additional half teaspoon full of the Smuckers. Another bust that actually tasted less sweet; I don’t even know how that’s possible. 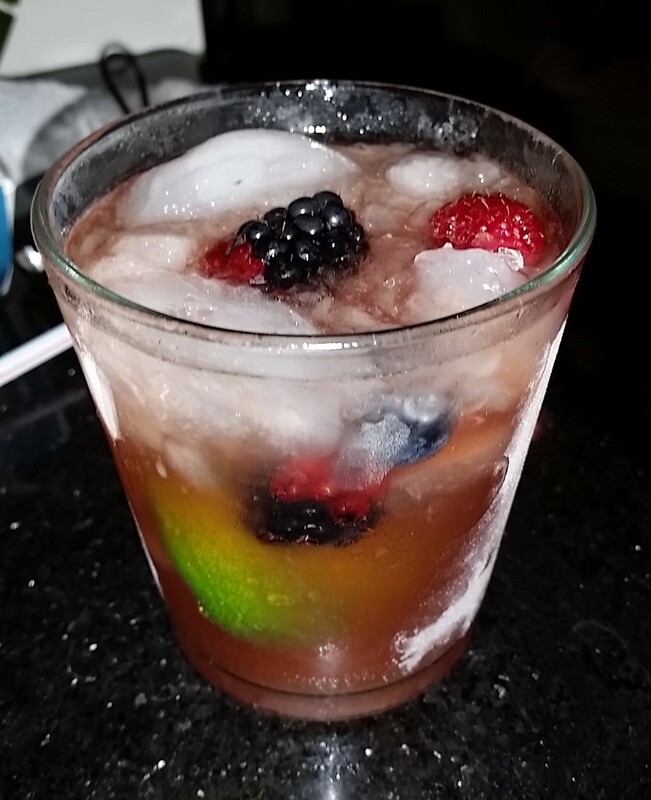 I did have fun throwing in various kinds of (overpriced but tasty) berries into the drink. They are such a part of this particular iteration of the Knickerbocker that Dave Wondrich actually suggests serving the drink with a straw and tiny spoon for the berries…personally, I can see the spoon but I’m not a big fan of straws with this sort of beverage. I want the ice to be a bit more forward, I guess. I also learned something new. You must refrigerate your supermarket raspberries and never, ever leave them in your car for a few hours on a 70+ degree afternoon, unless you like your berries better after they’ve grown fur. As a teenager, I found myself seriously infatuated with an older women. So great was the age difference that she had actually been dead since I was in kindergarten. Legendary wit and poet laureate of dissipated enlightenment, Dorothy Parker was probably the most interesting of the literary lights that graced New York’s Algonquin Hotel’s famed round table of notable quipsters. The informal gang o’ pals also included humorist Robert Benchley (Parker’s platonic bff), and critic Alexander Wolcott. Another great wit in the group, Harpo Marx, like Teller after him, never said a word when the cameras and microphones were on, but apparently could chat up a storm on his own time. Now, to be honest, while the Algonquin crew and especially the wondrous Ms. Parker definitely enjoyed more than their share of cocktails, there’s no evidence they actually ever sipped a single Algonquin. Still, they should have. It’s a dry, sophisticated drink, a fruity twist on the Perfect Manhattan that’s a really solid addition to the cannon of Prohibition-era beverages. Yes, we have no indication that they ever had the drink, but also no proof that they didn’t. I chose, therefore, to print the legend. Let’s just assume that the woman who we are told said ““If all the girls who attended the Yale prom were laid end to end, I wouldn’t be a bit surprised” and the man who opined that “Candy is dandy, but liquor is quicker” enjoyed an Algonquin together. It’ll taste better that way. Combine your whiskey, juice, and vermouth in a mixing vessel with the usual ton of ice. Some think you should stir it, but I say they’re wrong. Shake the dang thing vigorously and strain into a large, chilled cocktail glass. If you want smaller portions, or have small cocktail glasses, simply use 1 1/2 ounces whiskey to 3/4 ounce each pineapple juice and vermouth. Toast which ever Algonquin Round Table member you choose, but I choose the amazing Dorothy. The particular example of an Algonquin pictured above was not crafted by your humble boozescribe, but comes courtesy of ace mixologist, Ian, at my neighborhood watering hole, Tonga Hut. 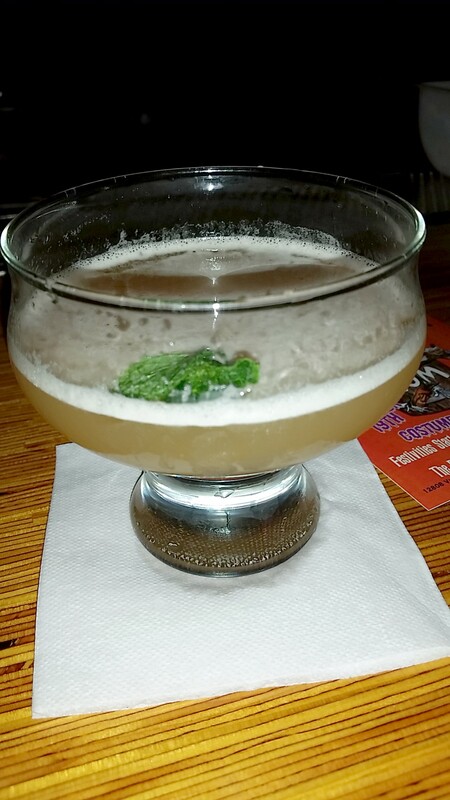 Following my instructions, Ian added a high-end Luxardo maraschino cherry and threw on a mint leaf on top, departing from the classic recipe with a Tonga Hut trademark. Making the drink at home, I had good luck with a number of different brands. Like Ian, I found that using 100 proof Rittenhouse Rye yielded an excellent result. I’m not the world’s biggest fan of Old Overholt — increasingly the default rye at craft bars nevertheless — but it still yielded a decent, if slightly more astringent, beverage. I also enjoyed killing my bottle of sweet Redemption Rye for an Algonquin’s sake. As for vermouths, I vacillated between your basic Martini and the fancier Dolin’s. The former was smooth and relaxed while the latter added a bit of spice. Oddly enough, I think I lean towards a simpler, dryer rye for an Algonquin. The most dramatic difference, oddly enough, was between two different brands of canned pineapple juice. (It’s against my religion, Lazy Bumism, to actually cut up and juice an whole pineapple.) There was a fairly precipitous drop in the quality of my drinks when I switched from Trader Joe’s shockingly delicious not-from-concentrate, which brags that it tastes like it would if you squeezed it yourself, to your basic Dole’s. I’m not an expert on the finer points of pineapple juice but I can tell you that the better tasting pineapple juice resulted in the better tasting Algonquin.